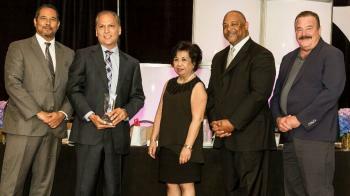 Long Beach, CA, July 22, 2016 – Osceola Consulting founder and CEO, Kevin Narcomey received the prestigious Southern California Minority Supplier Development Council (SCMSDC) 2016 Supplier of the Year (SOTY) Award. The Award was presented at SCMBDC’s 26th Annual SOTY Awards luncheon held July 22nd at the Hilton, Long Beach. Presenting the Award were Rick Hobbs SCMSDC Chairman and Director of Supply Management and Supplier Diversity, Southern California Gas Company (SoCalGas); Charles Harmon, Board Vice Chair and Senior Manager of Corporate Procurement and Corporate Services, American Honda Motor Co., Inc.; President Virginia Gomez and Joe Chow of SoCalGas who nominated Osceola for this award. “We are grateful and humbled for this recognition to both SCMSDC and The Gas Company, especially considering the many outstanding businesses also nominated” said Kevin Narcomey, “and we are particularly appreciative for the trust SoCal Gas has in continuing to work with us and with assisting in our growth and development.” Narcomey added, “Our recent efforts – expanding our services into the mid-West and East Coast - have continued to grow our business and thanks to The Gas Company’s assistance through the MDE program and Sempra Energy’s willingness to use our services we were able to develop the Technology Delivery Center (TDC) on the Morongo Indian Reservation, an alternative onshore outsourcing resource to offshore outsourcing that retains high value jobs in southern California.” “We are also currently developing a California State Certified Apprenticeship program to train local Riverside County residents for positions at the TDC,” Narcomey concluded. Osceola Consulting provides management consulting and information technology services focused on the energy and utilities industry. Management consulting services include program management, change management, and business process reengineering typically around large, complex business transformation programs. Information technology services include software procurement, solution planning, software support services and testing, as well as end-to-end systems integration and support. The company provides highly experienced industry and solution experts with specialties including customer service, finance and performance management, field operations, and asset management. Osceola is a Minority-Owned Business Enterprise (MBE) founded in 2006 committed to the sponsorship and promotion of diversity. Osceola’s founder is a former utility industry partner with one of the major global consulting firms and is a member of the Seminole Nation of Oklahoma. See www.OsceolaC.com for more information.